The festive season is also the season of discounts. Amazon’s Great Indian Festival has started today and deals on electronics would begin tomorrow on Flipkart as a part of its Big Billion Days sale. But these aren’t the only two e–commerce websites which are trying to outdo each other. Attractive deals are available on other platforms too and Paytm Mall happens to be one of them. If you want a new laptop for yourself, it is the right time to but the Apple MacBook Air. 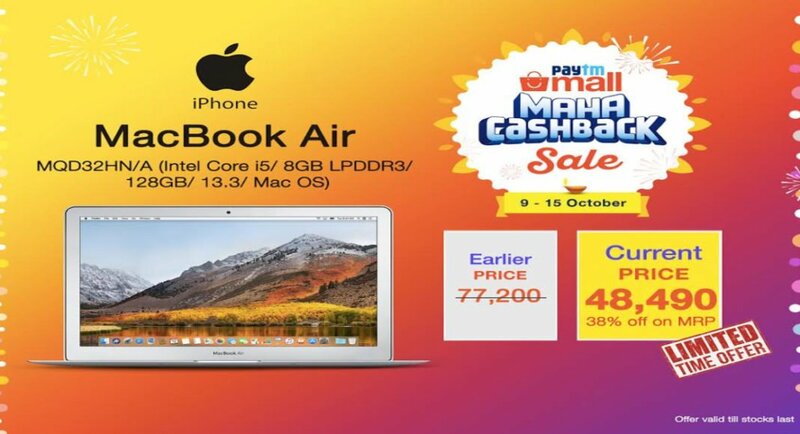 Originally priced at Rs 77,200, the Apple MacBook Air (128GB) is now available at a price of Rs 48,490 as a part of Paytm Mall’s Maha Cashback sale. If you visit the website, you will see that the MacBook Air is actually listed at a price of Rs 65,990. Customers will be getting a flat cashback of Rs 10,000 and vouchers up to Rs 5,000. These vouchers can be used for getting a free backpack and movie tickets and do grocery shopping, mobile recharges or bill payments. Flight vouchers are also a part of the deal. An additional cashback of 10% can also availed if buyers pay for their purchase via ICICI Bank’s credit or debit cards. Put together, these deals bring down the price of a MacBook Air to Rs 48,490. If you wish to avail this offer, you should know that it will go live today at midnight. the offer will be available for the entire day tomorrow or till the stock lasts. Apple MacBook Air is also available on Amazon India’s website and Flipkart, but at higher prices. While Amazon is offering the Apple MacBook Air at Rs 53,999, it can be picked up from Flipkart at Rs 62,990. But a further exchange offer on Flipkart of up to Rs 9,000 can bring the price of the laptop down to Rs 53,990 — which is more or less the same price as Amazon’s. Apple MacBook Air is powered by a 1.8GHz Intel Core i5 processor clubbed with Intel HD Graphics 6000 GPU and upto 8GB of RAM. The device offers a battery life of up to 12 hours. Other key highlights of the laptop include a range of built-in apps and programs including Siri, FaceTime, GarageBand, iTunes, and Time Machine.